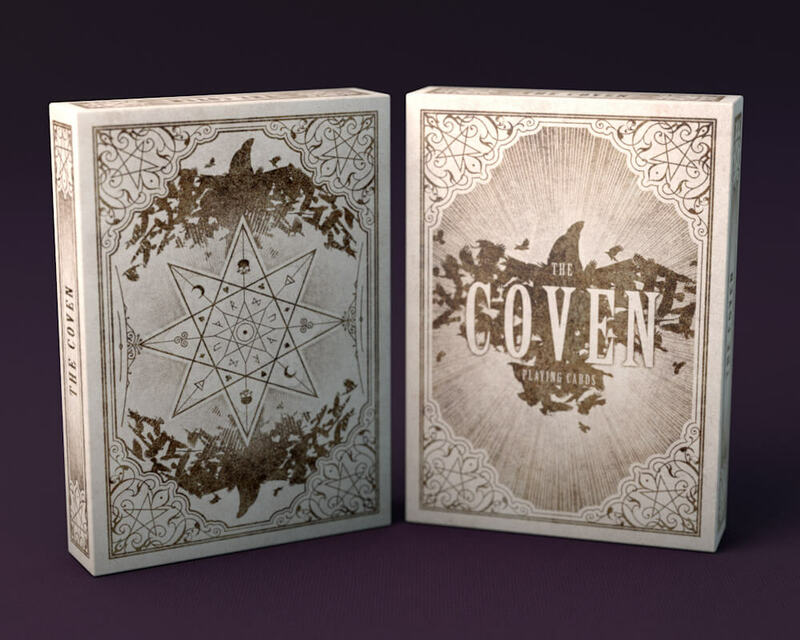 A deck of playing cards inspired by the magic of the witches and their Coven. Unlike most decks The Coven features an all female cast of court cards. The Kings and Jack hide their faces with masks, while the Queens reveal their beauty. Each of the witches wears a hooded robe with patterns styled to match traditional court card designs. Along with conventional features such as one-eye Jacks and the suicide King. Accompanying the witches are their familiars. This Coven has favoured the Ravens, who fly in a circle above the gathering as the witches cast their spells. The back design features the collective Ravens and a mystical star containing occult symbols and runes. These also appear as brooches worn by the witches. The Kings wear runes, the Queens wear their suit and the Jacks wear symbols. The Jokers come together to form the collective Ravens that create one large Raven, revealing the hidden face of the thirteenth witch of the Coven. The Ravens are also printing on the inside of the tuck box, giving the appearance they are trying to escape. A deck of playing cards inspired by London vampires from the Victorian era. As with The Coven, this deck also features an all female cast of court cards. Each of them have a different story to tell, but together they become The Sisterhood of Blood. Each of the vampires have names and backstories that help to bring these beautiful monsters alive. Along side this, each of the groups follow a theme, the Jacks have just fed, the Queens revel in their malice and the Kings immortality is coming to a close. This is a custom deck but it maintains all the standard features of a normal deck of cards, to make it usable and easy to read. These features also include the hidden ones such as the one eyed Jacks and the suicide King. The Jokers come together to form the Raven created out of blood. The inside of the tuck box is also splattered with blood.